Mary’s heir was her son Henry Carey, who, according to the inquisition, was aged 17 years 15 weeks and 5 days on 22 July 1543. Mary is the perfect “blank canvas” for novelists to create a story around, but whatever the truth of her later life and death, she had a happier ending than her brother and sister. You can find out some facts about Mary in my article Mary Boleyn – One Big Boleyn Myth. Weir’s other reason, the fact that six versions of this portrait exist, may make us question whether it is Mary but she can’t be ruled out at the sitter. Inquisition Post Mortem of Mary Carey, late w. of William Stafford, esq., and daughter and sole h. of Thomas late Earl of Wiltshire and Ormond, Ref D/DU 514/29/5, Fonds MANORIAL RECORDS OF FOULNESS, Essex Record Office. The transcription online gives her date of death as 1542 but this must be wrong because we know Mary was alive in May 1543 when she was finally granted her inheritance. 1545 – Henry VIII’s flagship, the Mary Rose, sank right in front of his eyes in the Battle of the Solent between the English and French fleets. Click here to read more. 1553 – Mary I was proclaimed Queen in place of Queen Jane. Click here to read more. 1584 – Death of three year-old Robert Dudley, Baron Denbigh, son of Robert Dudley, Earl of Leicester, and his wife, Lettice, at Wanstead. He was laid to rest in the Beauchamp Chapel of St Mary’s Church, Warwick, and his tomb pays tribute to “the noble imp”. Great informative article. What a pity that Mary fell out with her father and sister over her choice of husband and there was a long wait both for her dowry lands and her inheritance as well as being granted other lands to support themselves. And how sad that Mary did not live long enough to enjoy them more than a few months. I believe the painting in question is Mary. Every time I look at it I think that it is her without a doubt. I am not sure what it is that makes me think that but I do. Have you seen the actual painting? What are you thoughts on it? I have seen the painting very close up and it’s beautiful. It’s impossible to say though as we have no physical description of Mary – very frustrating! Iv seen the portrait at Hever Castle and I was looking for some resemblance to Anne but couldn’t see any, she has a soft round face if that is Mary most likely she took after her mother as Anne appears to have looked like her father, on his memorial brass he has a long face and pointed chin, features wich Anne inherited. Who knows, but that Mary may have led a more exciting life than her brother and sister. Definitely less intriguing & no doubt not nearly as exciting, but there is a lot to be said for peace and calm when you are trying to raise a family and live a normal, quiet life. It is incredibly sad the way her family ended up treating Mary. As much as I really do like Anne and George, i, too, liked Mary. 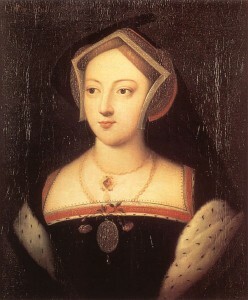 She may easily have been the glu that held the family together before they were the famous (or infamous) Boleyns. I think it is Mary. There is a difference in the style of the portraits of Anne and this portrait, but if you look closely, Mary’s face is a softer, fairer version of Anne. We may never know. She seems to have been really overlooked by the family after her affair with Henry. That may have saved her life in the long run. Of the 2 Boleyn sisters, I think Mary was by far prettier than Anne. Although Anne had that certain something that made her stand out from the crowd. Before Anne returned to court, Henry was happy with a pretty face for a mistress, and he usually got bored with them after a while. But Anne’s arrival changed that and we all know what happened there. I agree with Maryann Pitman here, I do believe that her family saw her as a black sheep, after she chose to marry Stafford and a life in the country. As it says in the first “other Boleyn Girl” film, “I was happy being a nobody” and I really think she was too. It’s just a shame we know so little about her, as I feel that her life after her affair with Henry and her marriage with Stafford would be just as interesting. I do wonder though if Mary ever saw Elizabeth or if she ever managed to heal the rift between herself and her parents, before she died. I wonder if Mary having spent time in the french court would have worn a headress more associated with Katherine. In books I have read about Elizabeth there have been references to women who were direct descendants of Mary, I can only remember one name, Lettuce I think it was. Can anyone tell me what the rift was between Mary and the rest of the Boleyns? She certainly died young it seems, but at least she had her head.